As the future viability of agriculture depends on soil health, it is imperative to protect this precious resource. Keeping this in mind, farmers in Andhra Pradesh’s Anantapur district are gradually shifting to polycropping under zero budget natural farming (ZBNF) from the prevalent groundnut monoculture being practised since generations. Currently, about 60,000 hectares (ha) are under ZBNF cultivation. The government plans to increase it to 100,000 ha by the end of 2018. “When introduced in September 2015, the critical thing about the zero budget farming initiative was its sustainability over a long period of time. Farmers were worried about reduced yields under ZBNF as compared to conventional farming practices,” says Vijay Kumar Thallam, in-charge of the project. However, things are gradually taking a turn for the better as more and more farmers are turning to ZBNF. From the beginning of 2016 (phase 1 of ZBNF) till now, 4,263 ha have been covered in Anantapur with 9,964 farmers taking up natural farming. As a result of ZBNF practice that encourages polycropping, groundnut is no more the solo crop being grown across many villages in Anantapur. In villages like Thammaiah doddi, Gundumala, Neelakantapuram and Nijavalli, polycropping is the new mantra. Lush green fields of paddy are interspersed with vegetables like brinjal, onion and spinach. A few farmers are trying out mulberry trees, along with pigeon peas. In a few farms, pomegranate trees grow with maize and tall coconut trees dot the border. Multicropping or polycropping has a number of benefits and is aimed at drought-proofing dryland agriculture that entirely depends on rainfall. This has benefited Anantapur in another way too. Migration has reduced as farmers’ income has become assured. Take the example of Nagaraju, a farmer from Govindapuram in Madakasira mandal (block). He migrated to Bengaluru in 2014 as there was not much prospect in agriculture in his village. But he came back and started polycropping. Since the past three years, he has been cultivating groundnut, castor, redgram and cowpea on two acres. The latest thing in his field is mulberry trees. “Conservation of agricultural diversity and using on-farm inputs are the paths to a sustainable future, Sonali Bisht, founder and advisor to the Institute of Himalayan Environmental Research and Education, says. 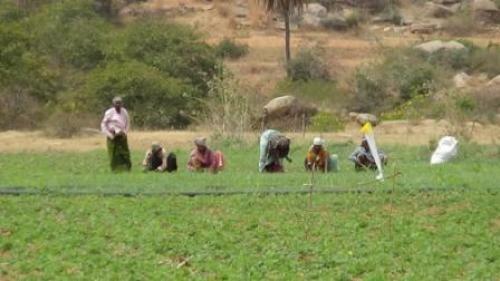 In Anantapur, 90 per cent agriculture is rainfed. “The rainfall amount may be there, but distribution is the main problem. Most of the times, crops have to be saved from drying up through protective irrigation efforts,” says T Y Reddy of Accion Fraterna, non-profit based in Anantapur. To make agriculture climate resilient, water run-off is arrested across slopes. Under watershed management, trenches and earthen bunds have been created to absorb rainwater across farmers’ fields. Farm ponds have been dug to collect excess water at the time of rainfall. In Thammaiah Doddi village, around 55 farmers are practising ZBNF. Mostly these farmers are smallholders with lands ranging from 0.80 ha to 2.02 ha. “Now, if we do not have rains for even 25 days, as a farmer I can say the crop will survive,” says Shivanna, who has been practising ZBNF since 2015. He grows groundnut, paddy and ragi on five acres. “The crop colour has improved and we get more yields. Crops survive because the soil stays fertile and moist due to the application of ghanajeevamrutam and dravajeevamrutam, says Chandrasekhar, another farmer from the same village. In Nijavalli village, farmer Balavaradaraju grows mulberry interspersed with papaya, onions, chilly and other vegetables on 0.80 ha. Each mulberry tree needs 2 litres of water a day. He practices mulching and as a result his soil does not need much moisture. “Migration had reduced to some extent, but farmers still continue to leave. Those who have water are lucky and can stay behind.” As a solution, he feels NREGS and ZBNF should work together. Right now, the former is only concerned with labour payment for farm pond construction. This is the traditional system of agriculture in drought-prone Rayalaseema. With the chemical input technology, farmers were made stop this practice. In one meeting on the failure of groundnut sole crop in Anatapure district, I suggested why not politicians encourage farmers intercropping. The politician says, if crop fails government will provide compensation; and if with crop success the farmer gets big income. This is the type of arguments made by politicians.